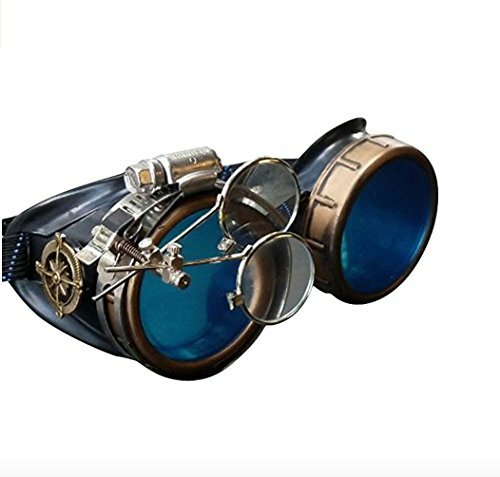 No steampunk cosplay is complete without a pair of retro-futuristic goggles. We assembled a list of the five best-selling steampunk goggles. But first...if you're unfamiliar with this science fantasy subgenre, it draws inspiration from the technological aesthetic of 19th-century industrial steam-powered machinery (Source). Closely affiliated with cyberpunk, steampunk is more concerned with alternative history- frequently focusing on the American "Wild West" or the British Victorian era if it were powered by steam (Source). If you really want to accessorize for a costume party- choosing the best set of goggles is paramount. 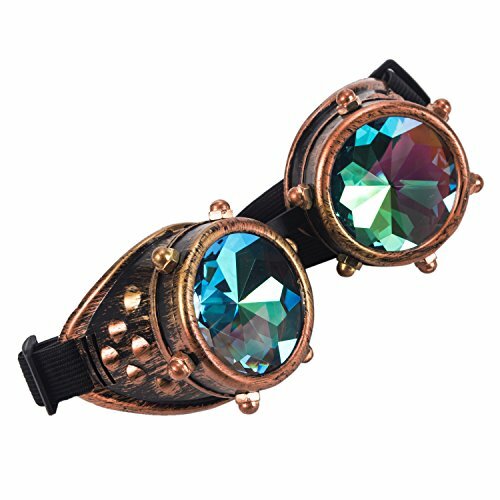 Now, these steampunk goggles aren't always that comfortable but are great temporary accessories. They also look good perched on the rim of a stove-pipe hat. Material: Plastic,Glass,Elastic Band. Color: Brass/Red Copper/Black. 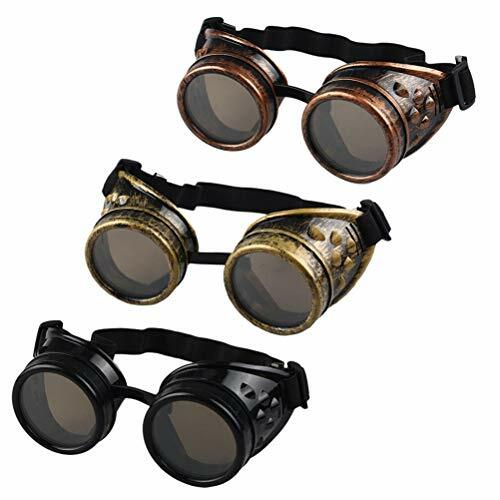 What are Steampunk Goggle buyers saying? 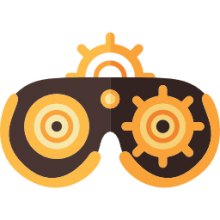 One option we took a look at was marketed as a pair of novelty Victorian Goggle glasses. One buyer applauded their appearance but complained that they pinched his nose- the bridge of his nose ended up getting painfully twinged. Even though he supplemented with some padding he still didn't have any success. A workaround is that he sets them up so that they rest on his hat-he says it looks cool but is not ideal placement. Another buyer said that he thought this would be a funny gag item, but he was surprised that the goggles were made pretty decently- they are not completely plastic and the lenses are made of glass with solid magnification powers. Other buyers say that they purchased these in advance of an event-saying that the goggles were the crowning, crème de la crème of their costume. Another pair we examined are actually kaleidoscopic goggles they use faceted lenses to create duplicate light waves which replicates the sensation of a repeating bugeye pattern. Funny enough, most buyers say that you can't actually wear them too long as they will make you dizzy because of the kaleidoscopic effect. 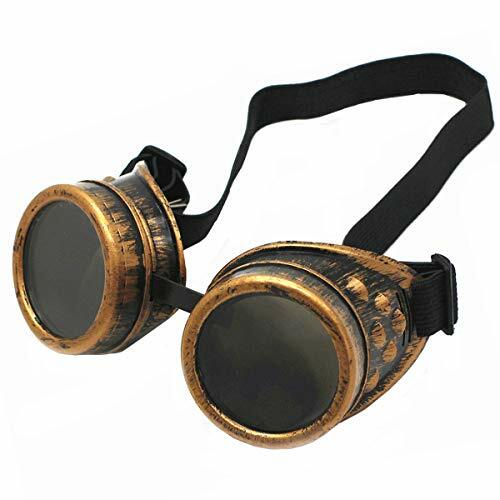 But if you are attending a costume party, many steam punk fans ended up wearing these on their hats and otherwise adorning themselves with the goggles as a fun side piece to enhance their appearance. Not as eyeware. 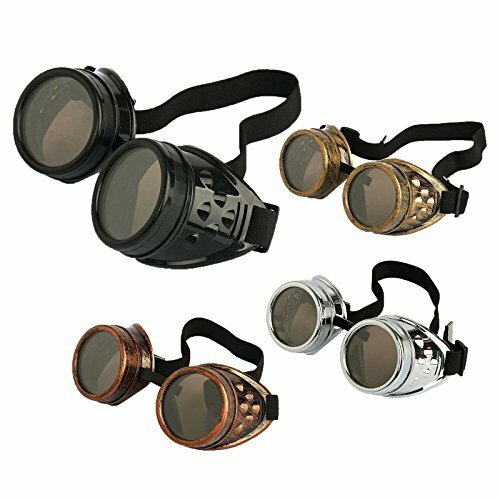 Another pair of goggles we took a look at are categorized as retro welding cosplay steam punk goggles. They are marketed as essential accessories for a steam punk's wardrobe. Buyers were pretty impressed- even though they are not very expensive, they aren't made of cheap plastic materials. This glass and aluminum goggle is equipped with an elastic band to accommodate different sized heads- the buyers say that in general they are not very comfortable. Though some enterprising users with a do-it-yourself streak ended up supplementing with foam lining to make them more wearable. Another cool pair of Victorian novelty goggles we took a look at have adjustable lenses a lot of silver metal framing and some bronze brocade making them appear retro and futuristic at the same time. We also took a look at a pair of spiked copper glasses-buyers say that these are best used as accessories for costume parties and not daily use. They say that when you hit them with light, the illumination really makes these goggles come to life. A husband-and-wife team who attended a steam punk costume party said that they were the rage with everybody complimenting their appearance-indeed they are sharp and shiny, very thin elastic strap isn't well-made. Steampunk is categorized under scientific fantasy or fiction. It's a combination of tech ideas and beautiful designs- inspired by the industrial machinery that was driven by steam in the 19th century. Its art is inspirational and striking. The subgenre is said to have its roots connected to a cyberpunk genre, as well as the American Wild West or British Victorian period. The inventions and technologies used in this subgenre have spread into art, culture, fashion and architectural designs. The technology features fiction-related machines examples found in Jules Verne’s and Stephen Hunt’s works. The basis of this subgenre and its technology are found in old machines like analog computers like the mechanical computers that are digitalized- the analytical engine by Charles Babbage, steam cannons and airships lighter than air. Steampunk finds similarities with elements of other genres like alternate history, fictions of historical times, horror and fantasy confirming its hybrid nature. The breadth of this category is seen in films produced during the old 20th century. Clothing and other artistic styles in the fictions during the Victorian era are part of it. This subgenre has diversified into different sections among them art and design, music, literature and settings, toys, fashion, film and television and video games. Below is an in-depth description of these styles. Functionality is emphasized by the steampunk movement- design under the arts and design segment. Modernity has seen this genre implemented in the production of useful objects like electric guitars and computer keyboards. The Victorian era has witnessed improvement in the reformation of items by use of leather, polished brass, wood, and iron. The high tech levels in craftsmanship welcomed the rejection of the industrial design and its aesthetic effect. Francois Schuiten from Belgium redesigned the Paris Metro Station in 1994 with this design in mind. He made a submarine in brass coating with gigantic cogs up the ceiling and scenic portholes giving a fancy impression. Recently, an exhibition in 2012 saw Steampunk House’s owner and his colleagues present beautifully designed timepieces, guitars, cell phones, entertainment systems and bicycles made using this genre. The Victorian era has dramatically influenced body wear and incorporation of modernity. Talk of gowns, bustles, petticoats, corsets, top hats, suits having waistcoats, coats, spats, tailcoats, military-inspired clothing and bowler hats with their origin from England during the 1850s. Accessorizing this clothing with costume ray guns, driving or flying goggles, parasols and timepieces are fun, typical fashion statements. Cellphones and stylish headphones can be redesigned to match the Victorian era items so that you be steampunk-styled. As well, tribal motifs and gas masks also are typical. The first ever clothing company with this design was launched by Kate Lambert in 2005. Her primary style featured post-apocalyptic and Victorian designs. With the love and increased demand, this category will be the trending, and most donned wear and used technology courtesy of research done by the IBM in 2013 from over five hundred thousand public posts on social media, blogs, message boards and news. The fashion runways by famous lines like Prada, Channel, Dolce & Gabbana and Christian Dior have implemented this designs in their clothing. Among the first fictional books featuring the analytical engine by Charles Babbage was Elementary Basic written by Andrew Ledger and Henry Singer in 1981. The book is educative and instructional on programming and its basics. In 2008, Nick Gever published Extraordinary Engines a book containing new tales of this sub-division by some of the writers interested in this subgenre. The book talks more on the experimentations during the neo-Victorian era. The setting of the World of Warcraft is of this subgenre’s nature with men steeply ahead of technology but still powered by mechanical power and steam. The American west setting is characterized by the western subgenres of Science fiction and Weird West and other sets like clockwork punk. Steampunk music is a blend of modern and Victorian elements. This music is divided into smaller categories like folk rock, big band, darkwave, industrial dance, dark cabaret, Carnatic, opera, hip-hop, world music, straightforward punk, progressive rock, and barbershop. Paul Roland is the father of this kind of music. Lindsey Stirling’s Roundtable Rival music video depicts a steampunk setting that is from the west. Recent artists like Nicki Minaj and David Guetta in their music video Turn Me On have employed this sub-category’s environment with David coming up with human droids. The Wild Wild West, a television series from 1965 features steam-powered technology and its advancements in The United States. April and the Extraordinary world- an animated movie is work of Jacques Tardi, a cartoonist who includes submarines, airships, trains and more of the steam-powered technologized items. Costumes of film actors in Alice Through the Looking Glass by Tim Burton in 2016 are of this design. Props and vehicles too. Television series Penny Dreadful has costumes and props similarly designed. Airship and gadgets in the film The Three Musketeers are steampunk in nature. Dal, a Japanese toy manufacturer, came up with Pullip Dolls that have a variety of this subgenre design. Hexiciah and Rebecca Steam by Mattel are Monster High Dolls employing a similar subgenre. In Steam World series, the players control steam-powered robots. Thief, Thief ii and The Dark Project have a set of this subgenre. Myst, Riven and Exile a production by Cyan Worlds are puzzle video games in which the infrastructure has been constructed to be powered by steam. Set during the Victorian era, The Chaos Engine is a video game that has a steampunk setting. It involves running and gunning.